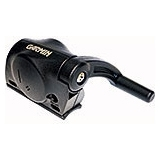 Speed/Cadence bike sensor (GSC 10). Monitor your pedaling cadence as you ride with this self-calibrating, wireless speed/cadence sensor. It measures and reports your pedaling strokes per minute, providing feedback for optimal performance.